So the biggest controversy on the internet as of late is the Mary J. Blige/Burger King ad. People can't seem to stop talking about this ad in which Mary is crooning about BK's new chicken wrap. I watched it and honestly I didn't see anything wrong with it besides the fact that it was corny as hell, definitely not worthy of someone like MJB, and it sampled my favorite track, 'Don't Mind', off her latest album. Obviously, these sentiments placed me in the minority because there are a lot of people who have a problem with the commercial and what they deem as racially offensive. There have been articles popping up all over the place about the ad. A writer over at Madame Noire called it Buffoonish and a writer at Clutch went so far as to write an open letter to Mary to express their disappointed. 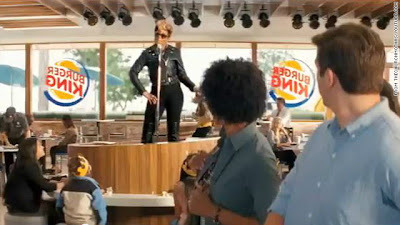 So the Question of the Day is: How do you feel about the Mary J. Blige/Burger King ad? Is it much ado about nothing? Or are people justified in being angry and offended because there is such a disparity when it comes to the depiction of black people in the media? Much ado about nothing. Not that deep. Weak marketing for sure and a desperate attempt by BK and an endorsement deal for MJB. That's all it amounts to for me. I agree that this is a bunch of nonsense. A lot of Black people are saying it's stereotyping saying that all Black people eat chicken. Let's face it, about 95% of us do eat chicken in some form. Secondly, I'm not mad at Mary for adding to her list of endorsements. She has bills to pay. And lastly, Mary does not represent all Black people. This commercial was taken out of context. I know there have been commercials out there that have played upon stereotypes but this is not one of them. We should be happy that Burger King is making efforts to work with more African Americans because I can't really remember the last time they had a prominent African American promoting their product.